Join us for our Ladies’ Book Club! The Book Club will be meeting Tuesday, February 19th at 4:30pm. “Splendid Isolation” will be discussed. There will not be a meeting in March; the next meeting is April 2nd at 5:30pm. “Beautiful Invention” by Margaret Porter will be featured. This is a novel of Hedy Lamar, and Ms. Porter will be joining the group for a discussion of her work. This social is open to all Brickyard members. Join us for Fun & Fellowship. AN HISTORICAL NOVEL Untamed, and virtually unchanged since its discovery in 1733 by General James Oglethorpe, Jekyll Island‘s history unfolds with the excitement and suspense of a fairy tale. Because so many of the world’s greatest minds and bank accounts gathered together in virtual isolation for three months each year, history was made on Jekyll Island. A group of tycoons with surnames such as Rockefeller, Morgan, Vanderbilt, Pulitzer, Baker and others formed their exclusive Millionaires Club on this island hideaway, the richest and most inaccessible club of that time. 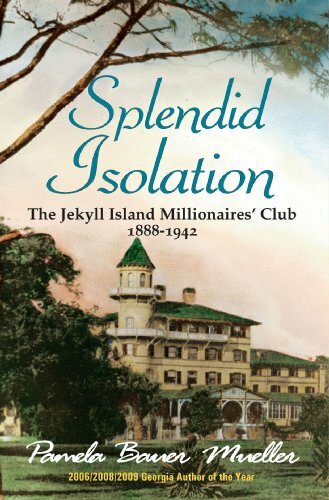 Between 1888 and 1942, Jekyll Island was open only to Club members families and their guests for hunting, relaxing and playing in luxurious ease. In this sweeping historical saga, you will discover the Millionaires joys, tribulations, and deeply guarded secrets told through the unique voices of four Club employees. In this true story of the island getaway that offered them sovereignty, discover how the decisions of these powerful men changed the face of world finances, business and politics as they built modern America.